Why Does My Dog Eat Dirt? Can Dogs Eat Honey? Are There Any Benefits of Honey For Dogs? Can Dogs Eat Corn? What About Pop Corn? Can Dogs Eat Spinach? Is It Safe For Them? Can Dogs Eat Coconut? Is Coconut Oil Good For Dogs? Can Dogs Eat Cashews? Can You Give Them to Your Dog? Can Dogs Eat Lettuce? Is it Toxic For Dogs? The popularity of raw dog food is on the rise. As a pet owner, I’m sure you want whats best for your dog which is a nutritious, proper diet. There are many dog food options that can be purchased, including raw dog food brands. A raw food dog diet blends raw meat, bones, fruits, and vegetables. However, choosing the best raw dog food brand isn’t an easy task. This guide will help you learn more about the best raw dog food on the market today. What is the best raw dog food? * click on the product name to be taken to Amazon where you can check the current price and read customer reviews. Below you’ll find in-depth reviews of each of the above products. Primitive dogs used to eat raw food regularly. However, if you plan on handing a piece of raw meat to your dog and calling it a healthy dinner, then you are wrong. It’s a bit more complicated than that. There are two main types of raw meat-based diets- home-prepared and commercial. Raw meat alone doesn’t provide complete nutrition and can lead to health problems. An appropriate raw food meal consists of protein but also vegetables, supplements, grains and other vital ingredients. Home-prepared diets include a variety of feeding guidelines and regimens. Some popular diets include BARF (Bone and Raw Food or Biologically Appropriate Raw Food) and the Volhard Diet. There are many reasons why pet owners consider feeding their dog home prepared raw food. Supporters claim that a home cooked raw diet improves digestion because cooking destroys essential enzymes needed for digestion. Additionally, proponents cite that raw meat-based diets are the evolutionary diet of dogs and that dogs can’t digest and absorb commercial pet foods. With any diet, there are risks associated with it. Commercial raw meat-based diets most commonly are frozen, pasteurized, or freeze-dried. Some of these products are formulated to meet AAFCO nutrient profiles, however, some are not. If you want to make sure you’re feeding your dog a nutritionally complete and balanced food, then look for the label on the packaging. Pet owners feed their dogs’ commercial raw meat on the philosophy that pets thrive on the same diet they would eat in the wild, but commercial raw meat products are much less time-consuming and simpler to provide. Additionally, the freeze-dried and dehydrated forms are concentrated so they don’t take up much space. The Merck Manual states that even though some commercial raw meat-based diets are frozen or freeze-dried, neither freezing nor freeze-drying destroys all the potential pathogens in these products. Also, commercial pet foods have also been recalled in recent years because of contamination from Salmonella. Some pet parents will take the time to prepare a raw diet for their dogs, but this can very time-consuming. Additionally, these owners need to be very aware of all the nutritional needs of their pet and incorporate needed additives into their dog’s diet. Otherwise, an unbalanced diet can cause harm. Some companies produce raw dog food that is convenient to give to your dog while still providing the nutrition needed for healthy living. Here’s a list of raw dog meal products that are reliable, low-processed, nourishing and satisfying. There are many more companies making raw dog food because of its popularity. To help you make an informed choice, let us provide you with five reviews of raw dog food choices. Give your dog what he naturally craves. Stella & Chewy’s Super Beef Meal Mixer it’s an easy way to pack your pooch’s diet with nutrients, probiotics, and antioxidants. Made with pure ingredients, Stella & Chewy’s Freeze Dried Dinner for Dog is an all-natural recipe that makes it easy to feed your dog only the good stuff. Straight from the bag, this food has the makings of fresh beef. It smells like hamburger and dogs love it! Plus, it provides your dog with the nourishment it needs to keep its coat silky and smooth, its gums and teeth in a healthy state, and its allergies at bay. Due to the higher price, many consumers use it as a treat or for traveling. Additionally, if you have a very small dog and use it as a treat, the chunks may be a bit too large for their small mouths. Raw Naturals is another reliable raw dog food sourced and made in the USA without artificial preservatives. A grain and gluten-free recipe deliver optimal levels of essential fatty acids, vitamins, minerals, enzymes, and antioxidants to support ideal health and wellness. This natural dog food is what your pet canine wants. Real lamb, lamb heart, and lamb liver are combined with fruits and vegetables including broccoli, carrots, cantaloupe, berries and more. The price for the amount of food is a bit pricey. Some pet owners like to use it as a topper. 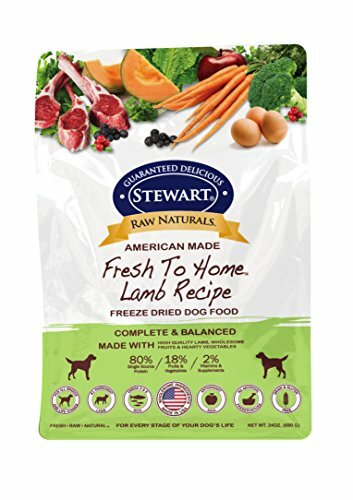 Raw Naturals by Stewart is the perfect crunchy snack for your beloved pet. No grains or fillers are added. The food is easy to travel with and does not need refrigeration. This brand seems to work well for those dogs with allergies especially the lamb formula. Primal Chicken Formula Nuggets Grain-Free Raw Freeze-Dried Dog Food offers your dog the benefits of a raw-food diet without you having to prepare the ingredients yourself! Primal products have no added chemicals, fillers, or preservatives, and this product is free of gluten and grains. This company includes certified organic produce, certified organic minerals, and vitamins to fortify the complete and balanced nutrition for dogs of all life stages. If your pet has a sensitive stomach, this recipe may decrease loose stool and allergies. With many health advantages, Primal Raw dog food aims to bring joy to both you and your dog. Mix a little water, and the food is ready. With natural, wholesome ingredients and no artificial stuff, your dog will be delighted to have this to eat. Like most raw dog food brands, this one is a little pricey. Many pet owners use this as a food topper or treat. Excellent taste makes every penny invested worth it. Pet owners rave about how much their dogs love this food. Another way to incorporate it into your dog’s diet is to add it to kibble. Many customers really like that most of the ingredients are organic and sustainable. This wholesome raw dog food helps promote proper digestion. The Honest Kitchen offers a unique alternative to traditional dry dog foods. The food is dehydrated, so just add water. The consistency of the food should like oatmeal once prepared. The manufacturer states that every 10-pound box of dog food contains concentrated nutrition that rehydrates to 40 pounds of fresh food. The food is made from human grade ingredients and offers a natural, healthy alternative solution for dogs who need it. It consistently gets good reviews from pet owners. Many picky dogs love the taste of the food. Plus, it seems to agree well with dogs that have sensitive stomachs. When prepared, this dog food has a mushy or pastelike texture. Some owners add kibble to the recipe in order to give their dog something to chew on. Honest Kitchen dog food products are natural and good for your dog’s health. Many pet owners like this food for their dog with a sensitive stomach. Made from sustainable sources, this mix will be ready in 3 minutes. It is 100% human-grade dog food that you and your dog can devour together! Stella & Chewy’s Duck, Duck Goose patties will be your dog’s new favorite food. The recipes crafted by this company try to best mimic a raw diet as nature intended. This sustainable dog food is beneficial for your pet’s health as it enhances its immune system and stamina. It also ensures that its skin, gums, and teeth remain healthy. Plus, eating a raw food diet may lower the risk of allergies and digestion issues for your dog. This food exceeds some pet owners budget. Plus, some consumers found the patties broken when it was delivered to the home. The packaging is not well suited for the product. Your pet will love this food, even if it is a picky eater. Since the ingredients used in these mixes are from trustworthy sources, the food is not only tasty but also nourishing. Serving these patties is also convenient for busy pet parents and those that like to travel. All of the products we listed are top quality raw dog food brands. It really depends on which brand your pup prefers. When on the lookout for the best raw dog food, you are sure to come across Stella & Chewy’s products. This brand is well respected and offers a variety of dog food for your pup. Ultimately, your dog will decide but Stella and Chewy’s Meal Mixers and Stella and Chewy’s Patties will give your dog what he craves. Made with the best ingredients and free of added chemicals and fillers, your dog will find this food to its liking. Copyright 2018 by The Happy Pooch. TheHappyPooch.com is a participant in the Amazon Services LLC Associates Program, an affiliate advertising program designed to provide a means for sites to earn advertising fees by advertising and linking to Amazon.com. Amazon and the Amazon logo are trademarks of Amazon.com, Inc. or its affiliates.